If every bingo card was available to only one player, then it would be very easy to calculate bingo odds and predict your chances of winning. 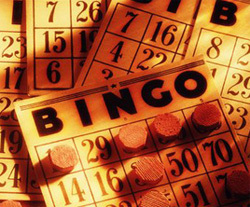 However in online bingo rooms like Kitty Bingo, every bingo card is available to all players. So what are the odds we are playing with, and how can you increase yours in order to win? In a random 90-Ball Bingo game in Kitty Bingo there are 96 cards. If we buy 10 cards, then our chances of winning are 9.6%, however we don’t know how many cards the other players bought and what are their chances of winning. A player who bought 20 cards has higher chances than ours in winning (19.2% in this case). There is also no way to identify popular numbers. If you play for 5-10 minutes you might notice that some numbers are popping up more frequently than others, however this is just a coincidence. If you extend your play to a couple of hours you will notice that most numbers pop up at the same frequency more or less. So don’t pick up cards based on what you think are popular numbers as this will not increase your chances of winning. What could have an impact on your chances though is to buy bingo cards with different numbers in them. I always pick my cards manually and never use the bulk buy option (buy 4 strips or buy 12 cards etc). This way I can have a look at the numbers and try to select ones with as many differences as possible. For example I don’t want all my cards to contain the number 12, cause if this number doesn’t appear I would ruin my chances. Which brings us to the next question. How many cards are good enough? In other words, what’s the optimal percent we should look at obtaining. This depends on the money every player has to spent, however I have to say 9.6% is not a high percent. Having above 20% chances of winning (21 cards out of 96 available) is 1 in 5 chances. Not that bad. To keep your balance organised and don’t go spending too much try this in games with cheap cards. Kitty bingo offers free and penny bingo games, as well as a very nice Sale every day where cards are 20% off. So for every 5 cards you can one free, which is a great deal if you want to increase your chances.